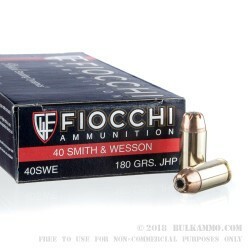 A 1000 round case lot of Fiocchi 40 SW ammunition at an incredible price point for .40 S&W ammunition, especially considering the personal defense type loadout that this cartridge offers. This is a .40 Smith & Wesson load that offers a jacketed hollow point that features a 6-cut design on a 180 grain lead cored projectile. The price of this ammunition is at parity with some of the cheapest range training ammunition in an FMJ load. 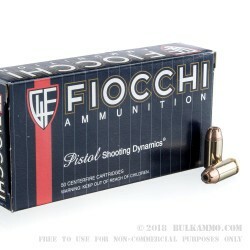 That is the type of value that Fiocchi has built their brand by offering to civilian consumers here in America. It’s rare to find such a refreshing pricing model, like Fiocchi offers. The 180 grain projectile achieves 1000 feet per second velocity out of the muzzle and delivers 399 pound feet of energy at bore exit. These compelling static ballistic numbers offer a shooter a lot of options with this cartridge. It isn’t at the highest level for ballistic performance, but it is also cheap enough to practice in bulk with this ammunition, offering you a chance to shoot at the range with the same ammunition you carry, and feel good about both choices. 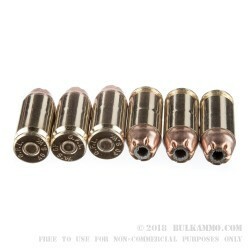 The perfect range and tactical training round for the .40S&W, due to the high reliability and good feeding, while still offering a hollow point design. 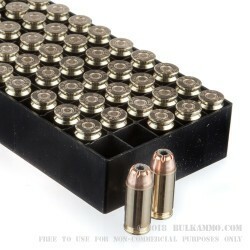 This is a bulk case with 1,000 rounds. Inside the case, you’ll find 20 individual boxes with 50 rounds inside each smaller box.